using just 3 litres of water. 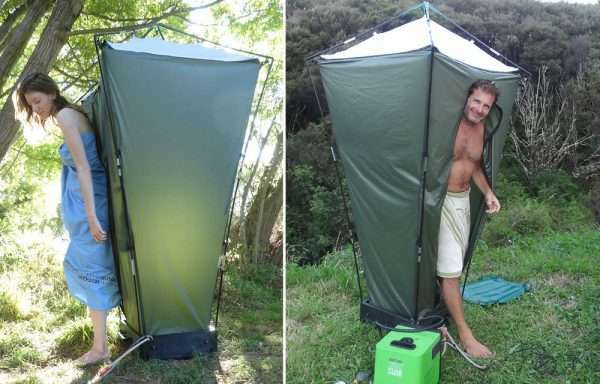 A private, portable shower which can be set up or packed down into a 6kg suitcase in seconds. Shower from any fresh-water supply or set to recycle for a fabulously long soaking without wasting water. Position the EverShower wherever and however you’d like – indoors, outdoors, roof on, roof off, with the frame or with overhead points of attachment. Place the included 12 volt electric pump into your water source – inside the tub (drain closed), if recycling, or outside the tub (drain open) for continuous fresh water. To recycle, just pour up to 10 litres of water into the tub (3 or 4 is ample). 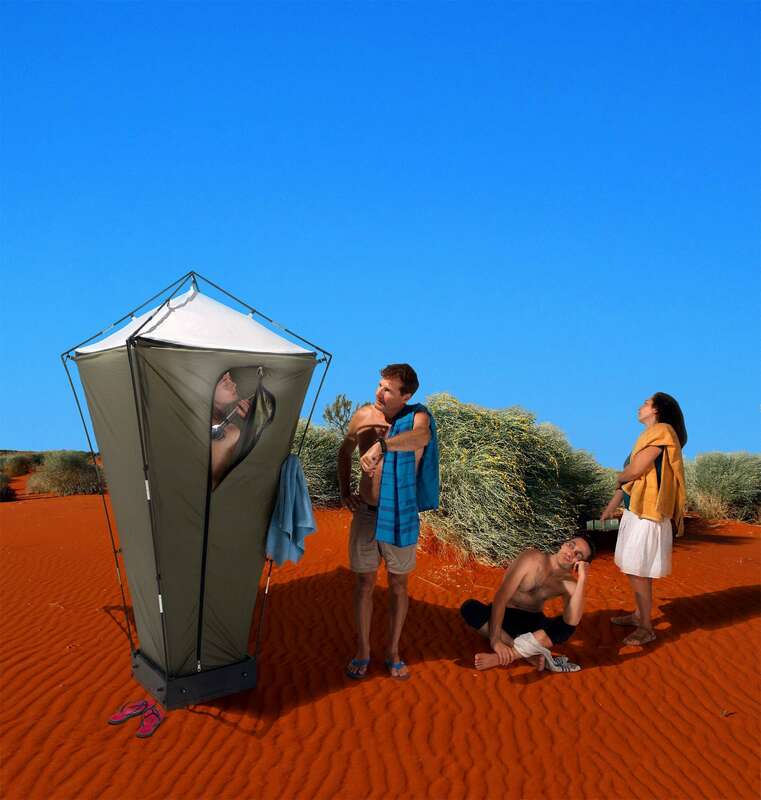 Use solar or stove heated water, or for real luxury, a portable water heater. Switch on the pump, step in and enjoy one fabulously, long, private EverShower virtually anywhere. Hang the shower handset above for relaxing, hands-free, guilt-free, private showering. For people who enjoy being clean as much as they enjoy getting dirty. Are you showering in your own dirty water? Yes, if recycling the water then it is the same water cycling around as it is in a bath. You can, of course, replace the water easily mid-shower to do a rinse, or not recycle at all if you have plenty of water available. In very remote, water-scarce situations you might even like to share the same dirty water between users. Sometimes is best not to use soap in these situation but it can mean you get to enjoy a long, guilt-free shower in the middle of the desert, for example. Gazing up through the steam to the stars in the desert is one truly glorious experience few people get to enjoy. Hot water can simply be added to the tub and then recycled or heat can be continuously added by pairing the EverShower with a water heater. Pour 10 litres of water into the tub in the morning, place it in the sun with its solar-absorbent cover and by the afternoon you already have 10 litres of hot water ready to use. Or, heat water on the stove and pour it into the tub. If the shower feels too hot just let it cycle a few times until the temperature is nice then step inside. 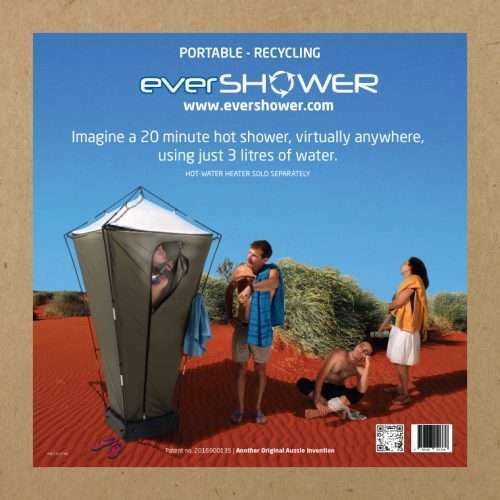 Or pair the EverShower with a portable water heater. Instead of pumping the water from the tub to the handset and back again, pump the water via a gas water heater. With the roof attached the EverShower quickly feels like a little steam room. If you’re planning on going somewhere cold then an instant gas water heater is definitely the way to go. EverShower has been made compatible with several gas/propane water heaters such as Coleman’s Hot Water On Demand. EverShower is shown here being used with Coleman’s Hot Water On Demand. How much gas (propane) does it consume when using the heater? If you recycle heated water then you are retaining much of the heat within that water. Therefore, very little energy is required to maintain the temperature. Gas/propane/L.P.G consumption, when using the heater, is very negligible indeed. What about in really cold conditions? 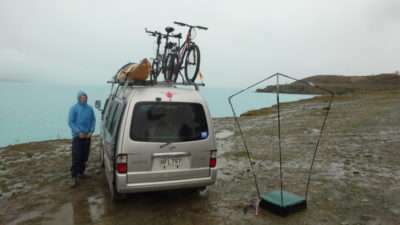 We’ve been using EverShower in the New Zealand snow and found it to be absolutely amazing. When using the gas water heater the shower tent becomes a little steam room in seconds. Fifteen minutes later you won’t want to get out. Better still, if you’re recycling the water, you don’t need to get out. Not only are you not wasting water but by recycling the water, it is also retaining much of the heat so it takes very little gas to keep up the temperature. How big is it? Is it truly portable? EverShower’s unique patented design means plenty of room where you need it most – around arms and shoulders. 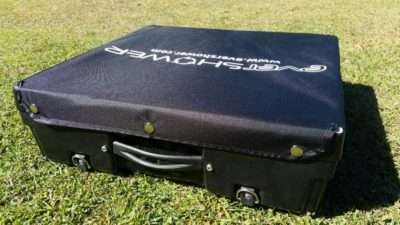 With around 2 metres of internal height (roof on) it still packs down to a small carry case about 50 x 50 x 15 cm and all just weighing around 6kg. How is the water pumped? Water flow is powered by a very efficient 12 volt submersible electric pump. Simply plug into a motor vehicle’s 12 volt cigarette lighter socket, battery pack or converter. Alternatively, the Coleman water heater has it’s own lithium-iron battery which can power the pump for about 80 minutes and can be recharged and used directly from 12v or 240v. When recycling the water the pump is attached to a saddle inside the tub. It literally pumps the water from the tub up to the handset and back down. To run on continuous fresh water the pump can be detached from the saddle and submerged into your own fresh water bucket, for example, or jerrycan. The high volume pump is rated for many thousands of hours of showering and with a very low power consumption of around 2 amps. How can EverShower be used with a water heater? 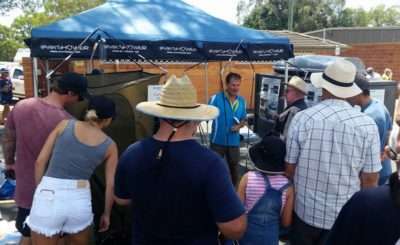 There are many portable water heaters on the market and the EverShower will function well with most of them. The basic principle is that, instead of pumping the water from the tub up to the handset and around again, it pumps via a water heater. Most portable water heaters will come with their own water pump. However, the EverShower pump fits nicely into the EverShower tub so you might prefer to use this pump instead. In order to use the EverShower pump it may be necessary to convert the end of the water hose to a regular garden quick-connect system. If your EverShower did not include an adaptor kit then it may be easy to convert like this. Keep in mind that it may be necessary to soak the end of the hose in warm water first in order to make it easier to work with. Alternatively, some portable water heaters work well with a separate, external water pump. The intake for these is usually just an open hose. If this is the case we recommend the purchase of one of these. These inline filters fit nicely into the EverShower pump’s saddle located inside the EverShower tub. The open hose can then be easily attached. I will be necessary, however, to first cut the intake nozzle on the filter on about a 45 degree angle so that it’s opening is not restricting the water-flow when placed onto the tub. Fresh water can come from any available source within reach of the EverShower pump or, for example, using a regular domestic, mains pressure water hose. When the EverShower is set to recycle the water the pump simply stays inside the tub, secured to it’s cradle. Water is then added to the tub itself (up to about 10 litres but we find 3 or 4 litres more than sufficient). When using the water heater and recycling, the pump also stays inside the tub. Water from the tub is simply pumped to the water-heater then up to the shower handset then back into the tub. The Coleman water heater can also run directly from a mains pressure water hose. Yes. 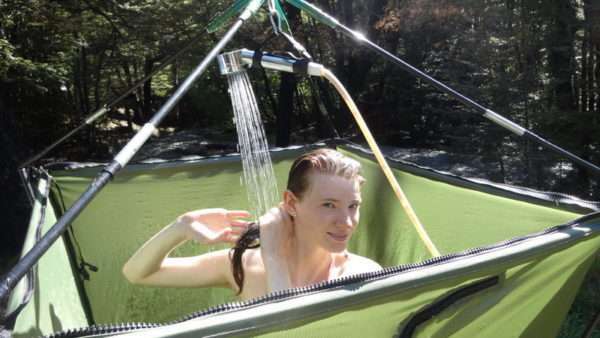 The tent-screen and tub retain the water within the EverShower system. 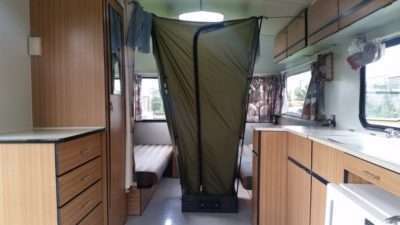 Here’s an example of it being set up for use inside a small camper van, even though this particular van doesn’t have a very high ceiling. It can even be used inside a regular domestic bathroom, tub only, for massive savings in water and energy. Essentially it’s a washroom which can be packed quickly away into small drawer – great for tiny houses, small apartments, offices, boats, caravans etc. Please follow manufacturer’s recommendations closely with regard to safe working environments for water heaters. How can I use EverShower inside my home? The EverShower works very well indoors. To use on continuous fresh water rather than recycling just position the drain in the floor of the EverShower over a drain, for example, in your bathroom floor. Alternatively, you could save enormously, in both water and water heating costs, by recycling. Just pour a few litres of warm water into the EverShower base and let the EverShower pump recycle it (IE. from the base up to the handset and back again). Soap up and wash off, then pump the used water down a drain or sink via the handset. Pour in another 3 or 4 litres for a long-as-you-like, guilt-free, money-saving rinse. The only additional item you might need if recycling is a small transformer to provide 12 volts. EverShower has a surprising ability to function well even in windy conditions. 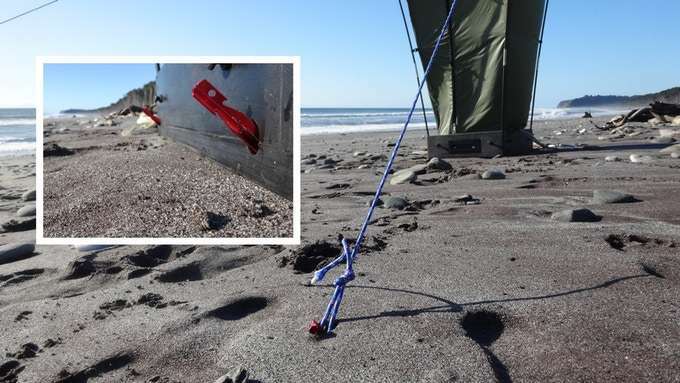 It comes with four guy ropes and strong alloy pegs but in practice we’ve found that really only one guy rope has been necessary, in the direction of the wind and attached to an immovable object or just pegged into the ground. The EverShower tub itself also incorporates four peg anchor points. Obviously the weight of a person and water in the tub tends to keep it stable in mild conditions. 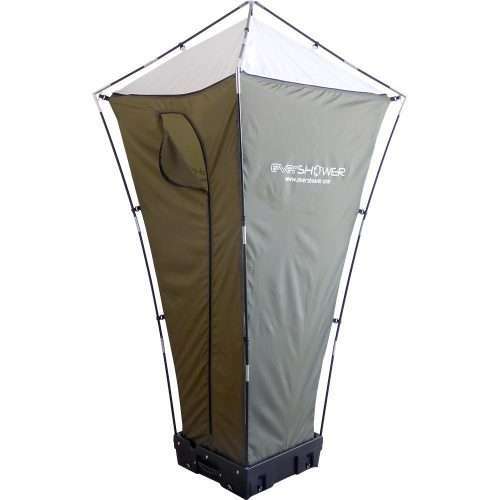 If an un-pegged, empty shower does blow over in the wind the frame will provide good protection for the tent fabric and once it’s laying down it’s actually a very aerodynamic shape, so tends not to travel any further. 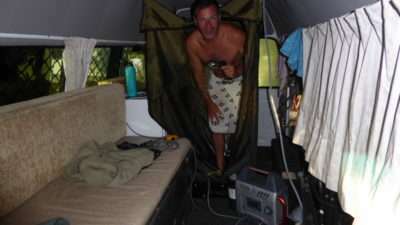 In extreme conditions the tent can simply be unclipped from the frame, dropped into the tub and the cover attached. It this mode it is able to withstand some of the most horrendous conditions but ready to use next time in a flash. What if there’s no 12 volt power source handy? The Coleman Hot Water On Demand incorporates a lithium iron battery which will power the water pump for around 80 minutes. The HWOD’s battery can be recharged via a motor vehicle’s 12v cigarette lighter or 240v. Adaptors are available which can enable the pump to be connected to a regular household power supply. View the 240V adaptor by Powertech. There are also 12 volt battery packs which can be used virtually anywhere and recharged as necessary. Many other water heaters also include their own rechargeable 12 volt power supply. How do you drain the water when using it indoors? There are a few options: If there happens to be a drain in the floor then the EverShower can simply be positioned over it so that it corresponds with the drain in the EverShower tub. If there’s a drain or washbasin within reach of the shower handset then it’s just a matter of turning on the pump (just mop the last little bit out with a sponge-cloth). 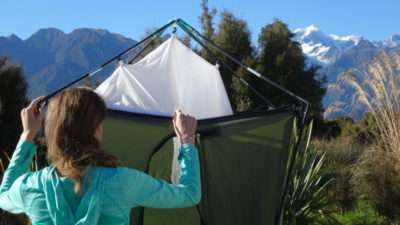 Alternatively, just release the tent screen (or drop it into the tub) and carry the tub outside or to a sink, for example. How can it run on continuous fresh water? The EverShower pump can be placed into any nearby fresh water source. The drain in the tub can be opened and the EverShower can then perform just like any regular shower. The Coleman water heater (and many other water heaters) can be connected directly to any garden hose (no pump required). Is is suitable for heavy people? We’ve had some very heavy people using them and haven’t broken one yet. However, it is important that it be situated on a flat, even surface and, if there are sharp objects like gravel or stones, that matting be placed underneath. The base measures 50.5 x 50.5 x 15 cm. 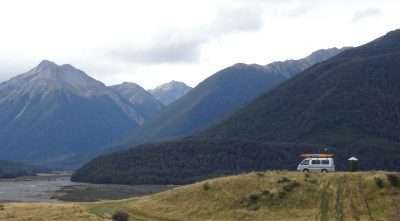 The overall height when set up with the frame is approximately 220 cm. 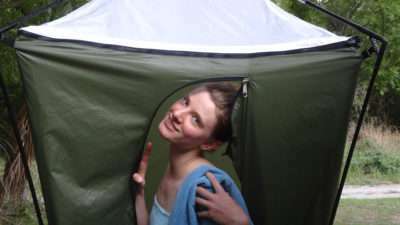 The width across the top of the tent is about 110 cm. The unique tapered design provides ample space where it’s needed, around arms and shoulders but is still able to pack down quickly and easily into a small case. Can we use our own pump and/or shower handset? Yes. The EverShower pump and handset have been specifically chosen for their reliability and efficiency. Obviously, when recycling the water “efficiency” becomes a non-issue in terms of water use. 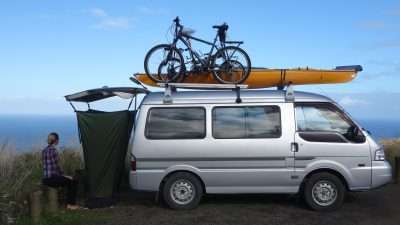 For example, we use the Smarttek6 water heater in our camper van (because it suits the space better) and we use a big 6.5 litre/minute water pump and a huge shower handset. This combination gives us a better water flow than most regular domestic showers. Purchases can be made by credit card without a Paypal account. In the shop just click on the Paypal tab and it will take you through to choose payment method. Do we have to buy the water heater separately? No. We sell the complete bundle ready to go. We also supply the EverShower on its own. 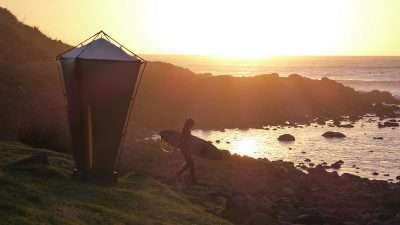 The EverShower, without the heater, is still an independently, fully functioning shower. 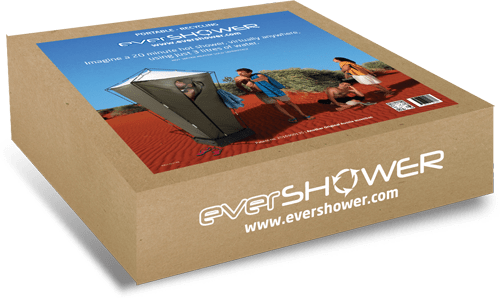 Many customer prefer to purchase the EverShower on its own because either, they already have their own water heater, they’re happy just to heat the water on a camp stove, they’re travelling to a warm climate where they do not require heating at all or they just want to see how it goes and may purchase a water heater later. If I live outside Australia does it make more sense to purchase the hot water system locally? Yes it does. The saving in shipping costs would most likely make it much more economical to purchase the water heater locally. The EverShower is made compatible with many different water heaters. We recommend the Coleman Hot Water On Demand, which is widely available around the world, but other heaters may be preferable depending on the intended use. Can EverShower be used with any water heater? It can certainly be used with many different types of water heater. We like the Coleman Hot Water On Demand because of its compact size but we’ve also used the EverShower very successfully with the Smarttek6 and the Aqua Cube. Can we use EverShower with a wall-mounted water heater such as the Smarttek 6? Yes. Of course, heated water from any source can be poured into the EverShower tub and used for recycling and other heaters can also be used to recycle continuously heated water. 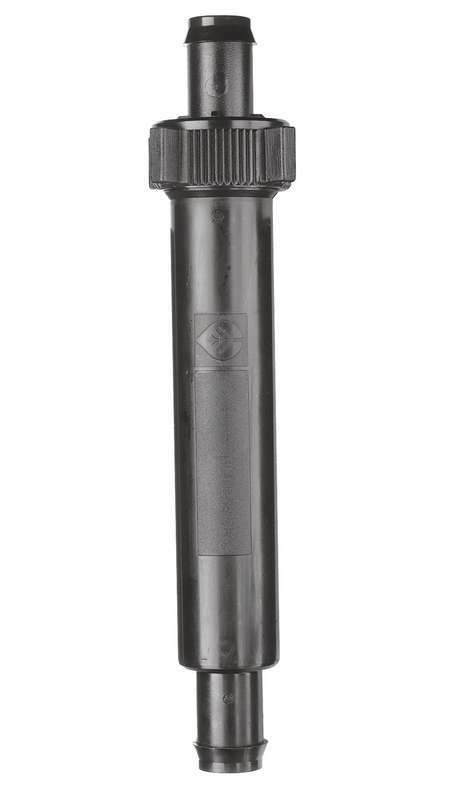 The EverShower comes with a little 15mm adaptor which will allow you to connect the water hose from the EverShower pump to a regular garden hose quick connector. Water can then be pumped from the EverShower tub directly to most instant gas water heaters, out to the shower handset and back into the tub for recycling. 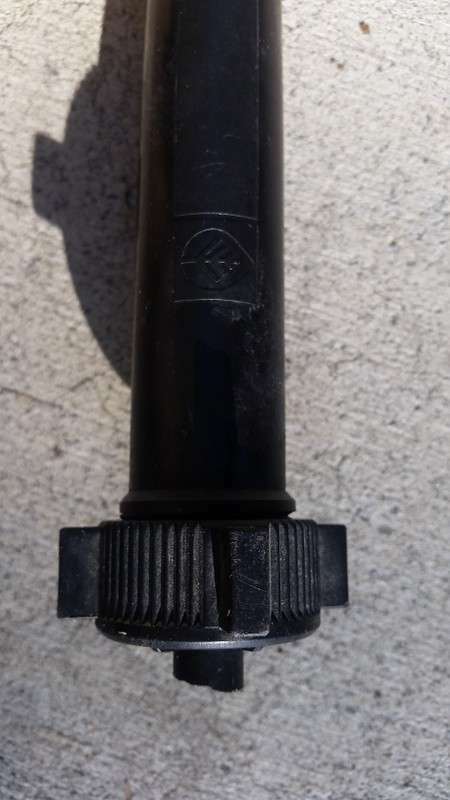 If a different pump is required, or a bigger capacity pump desired, just connect a standard inline water filter, such as that pictured below, to the end of the heater’s intake hose and cut the filter inlet at an angle as shown. This filter can then be strapped into the cradle which normally holds the EverShower pump inside the tub. If the pump and/or heater are also being used for drinking water then it will be necessary to run and appropriate cleaning solution through the system after showering. Click here to check out the brilliant Smarttek 6 water heater. How does it cope with soap? It is not a problem if you use soap especially if you replace the water mid-shower to rinse. It’s a good idea of rinse the pump with fresh water after using with soap. For those in very water-scarce situations, who would like to share the water between users, it can be better not to use soap at all. 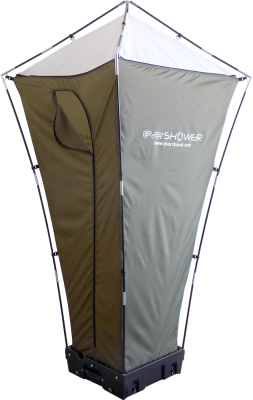 We sell the EverShower as a bundle, complete with the Coleman gas water heater normally $929.00 but currently just $845 . 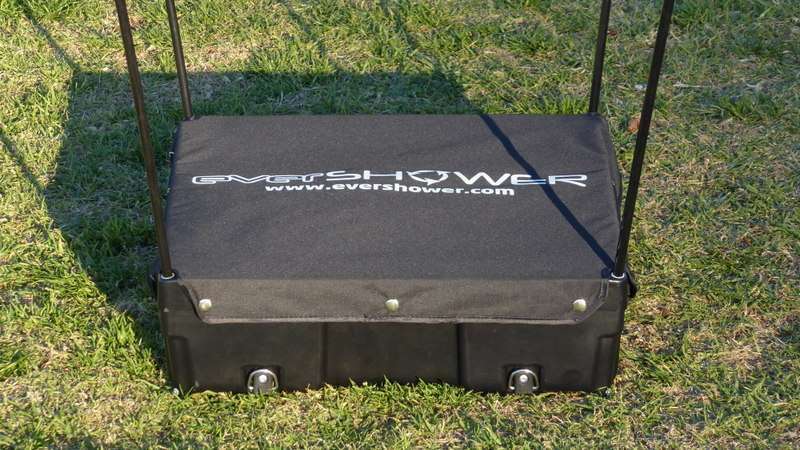 We offer the EverShower on its own normally $399 but currently just $349. The stand alone EverShower is still a fully-functioning shower complete with water pump and shower rose etc. 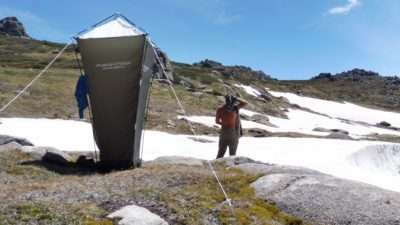 You can heat the water yourself, on the camp stove, for example, or even in the EverShower tub (cover on) using the free energy of the sun and then recycle that water. The EverShower comes with a little power cord adaptor anyway in case you decide to add a heater yourself at a later date. The EverShower will function well with many different types of water heaters. We like the Coleman heater due to its portability. Can EverShower be purchased without the pump kit and shower rose? The pump kit and shower rose which are included with the EverShower have been specifically chosen for their performance and economy. While this is a brilliant little kit the cost of it does represent only a very small proportion of the complete EverShower unit. The saving without it would not be great. Our intention is to provide a very effective, cost efficient pump kit to make the EverShower a complete system and to help get customers started, however, the option exists to replace it with a more powerful pump, for example, and an even more luxurious shower rose. Here’s a good example. Note: Obviously, the main advantage of the EverShower system is the fact that it can recycle the water. For this reason a misty, water-saving shower rose is unnecessary. The shower rose included with our EverShower is quite luxurious. It doesn’t just provide for a really nice flow of water, it incorporates silicon seats around each of the little jet holes which just need a little flick with the finger should they become blocked, for example, with sand or dirt. Do you ship EverShowers to countries outside Australia? Unfortunately we do not ship EverShowers outside Australia at this point in time. 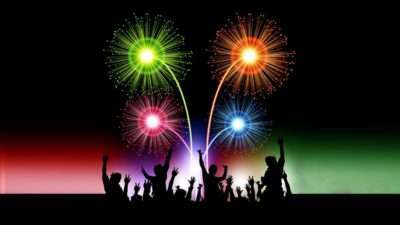 Hopefully soon we will have distributors in your country. We welcome your feedback. If you have any ideas or suggestions as to how we might improve EverShower please write to us. We’re a new self-funded, start-up so our first shipment is not huge. If you miss out this time please feel free to contact us and we will prioritise you for the next shipment.